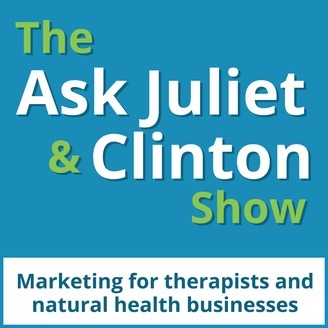 Juliet Austin and Clinton Power answer the most pressing questions therapists and natural health businesses have about marketing a business. 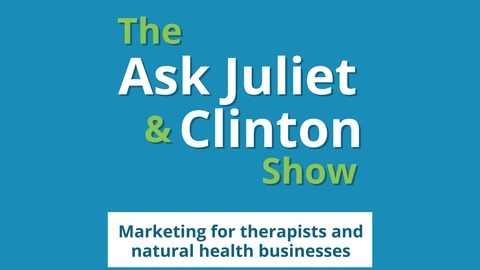 After 150 episodes, this is the last episode of The Ask Juliet and Clinton Show. We have answered most of the common questions therapists and wellness professionalshave about building a therapist practice at the beginner sand intermediate level. We will still be providing free content via our Facebook Group, and have our free members program. The long of the short of it is that we’re not going anywhere, so stay tuned. In this final episode we discuss the 5 most downloaded episodes. Hope you enjoy it! Episode 20: What is the best day and time to post my blog posts to get the most views? Episode 2: What are the best marketing and advertising methods for therapists? Episode 8: What are the 5 top web design companies you recommend for building a successful website without needing high tech knowledge? Episode 4: How do you spread the word about your new website once it’s live? Episode 5: How do you deal with marketing overwhelm? If you’re new here and want to build a therapy or wellness practice, listen to all the episodes and you’ll be well on your way. Search in the search box (on the side bar of any page on our website) for any specific question you want answered. A big Thank you to all our loyal listeners! Get the show notes with all the links and resources mentioned in this episode at http://askjulietandclinton.com/150. Askjc 149: How do I get people to join my group on Facebook? Askjc 148: What are short-term marketing strategies that bring immediate results? Askjc 147: Is it possible to learn how to write copy myself or should I hire Juliet? Askjc 146: What are the top 3 elements of good website design?